Store & Protect MacBook Pro 15"
With an attractive textured dots finish, the rose quartz Hard-Shell Case for MacBook Pro 15" from Incase Designs Corp is designed to store and protect your valuable laptop from scratches, dirt, and minor bumps. A well engineered case, it features thermal vents for improved cooling, cutouts for unobstructed access to all ports and functions, and raised rubber feet to help prevent unwanted movement when placed upon smooth surfaces. This case is made of injection-molded polycarbonate plastic for strength, durability, and style. 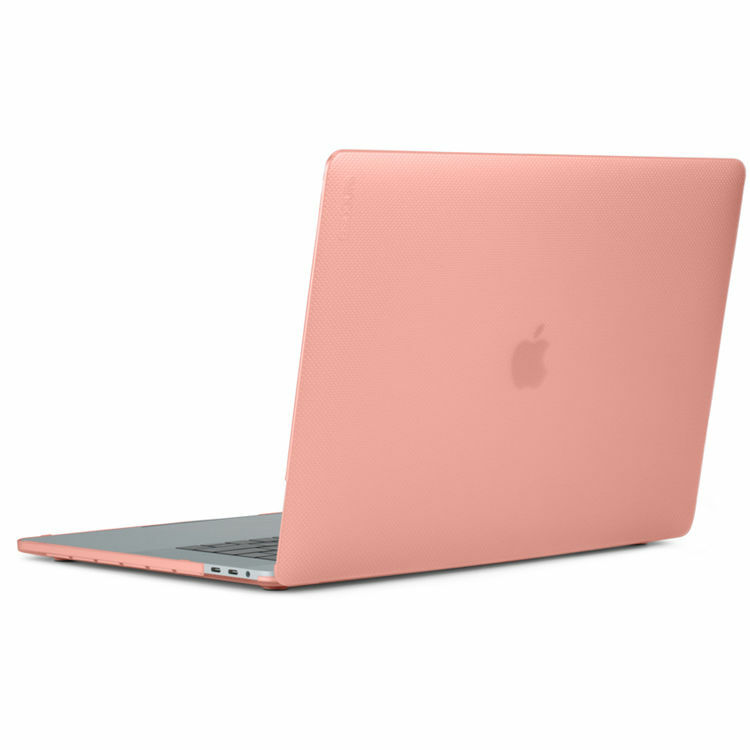 Box Dimensions (LxWxH) 15.1 x 10.0 x 1.0"
Hard-Shell Case for MacBook Pro 15" (Dots-Rose Quartz) is rated 2.8 out of 5 by 6. Rated 5 out of 5 by Dave from Perfect fit, solid protection Have been using for 2 weeks, and so far seems great. Installing required forceful pressure to ensure all tabs 'clicked', but I'd rather have that than a loose fit. Only issue is that with the clear dot design, my slate grey mac looks like a silver finish, but that's really not an issue ;-) Great case, and would recommend this, and any other Incase product. I've been happy with all products I've purchased from them. Rated 1 out of 5 by Katie from Getting ready to return I've had this case less than a week and the front corners are already cracking. I can count on one hand the number of times I've carried my laptop with me and I had hoped this case would offer protection for more than just a few weeks, as I sense it won't be long before it totally breaks. Rated 2 out of 5 by Dan from Too Brittle Ive had this case for less than a year now, and it has cracked on both corners. Ive never dropped my laptop, or abused it in any way. Note that my Macbook Pro rarely leaves the house, and when it does I keep it in a well-padded carrying case...I baby my computer gear. Not recommended. Rated 3 out of 5 by Jessica J. from Does the job This case protects the computer from scratches and dings, but it doesn’t offer protection against drops. It attracts cat hair and dust like crazy. Also, the Apple logo isn’t very visible through the black case. It fits well and was easy to install. Rated 1 out of 5 by Brian from Dont do it! TERRIBLE design! The way the base clips onto the laptop, the clips cut into your palms whenever youre trying to type on the laptop. I used to think these guys (Incase) were good. I cant imagine trying their products again personally. Rated 5 out of 5 by Juan Camilo from Fits perfect!!!! it is a great choice to protect your mac. it is thin and?discreet. Hard plastic.